In late 2016, I got F31club up again. It was in shambles as a bare forum. One thing I was happy to see was F31_Pilot make a post. Then he disappeared again. I contacted him on F31club and we exchanged numbers and had text contact. F31_Pilot (who has posted the last 13 years with that name) was one of our forum tech moderator. He helped out tons of people on the forum. At time, he was staying in Orange County, Los Angeles. When we set up the Southern California Meeting, he was suppose to be there as well, but got busy with work. SlappinM30 I met last year when I came back from Japan and was picking on an M30 convertible in Rocklin. Prior to that, we had never met. On F31club, SlappinM30 constantly kept trying to get a Northern California meet going again. I was preoccupied and I never did meet with him. When F31_Pilot (Kue) said he lived in Elk Grove, I told him that he was way too close to not meet up. But he is also busy with family as well. SlappinM30 has been working Scale Mob Scalers and cranking out ideas and parts, so he’s been pretty busy. Finally, I decided to ask both of them if I can meet up, even for a few minutes (If you know me, nothing ever ends up with a few minutes). It was set and as soon as I got off work, I headed to Kue’s house. It was cool to finally meet him after all this time. We drove to Mike’s place started messing with Mike’s Rock Crawling RCs. We then sat til 2 am talking about various topics. 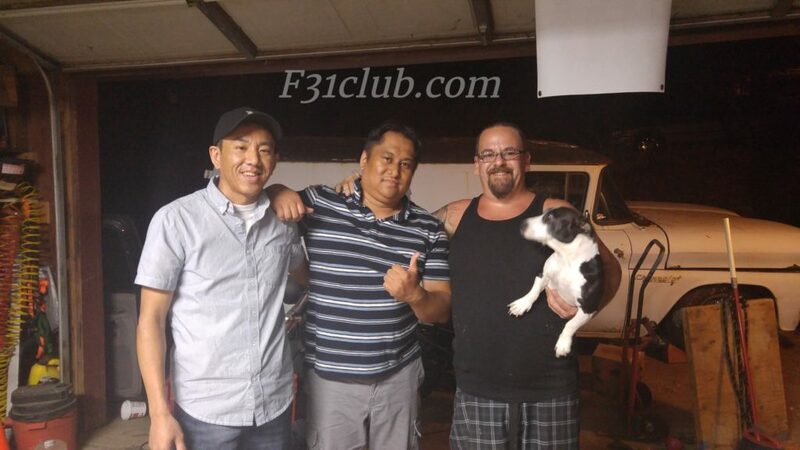 Since F31s have been my tunnel vision, it was cool to talk about some of the stuff and people on F31club. Also, I was glad to see that Kue and Mike had a HUGE common interest in car audio. Since I have very little knowledge, I stood back and listen to their conversation. This was cool in a sense that this was another level of commonality besides the M30. We sat there and talked about how cool it was to finally meet and the truth is, I can’t help but wonder if it could have happened earlier. Regardless, better late than never. This is something beyond the car. It is about the brothers and what we built together! This entry was posted in blog, events, history, Meetings, Owners and tagged #f31club, #f31レパード, F31_pilot, f31club forums, f31pilot, scale mob scalers, slappinm30.